I have sold a property at 682 ENGLISH BLUFF RD in Tsawwassen. 4 Bedroom family home on 13,000 plus sf lot in upper Tsawwassen. Many renovations done in past 9 years. Dark oak floors throughout main, 3 year old, open concept, modern kitchen and eating area with built in window seating. Custom builtcabinets, quartz counter tops, and s/s appliances. New picture windows overlook huge, fully fenced, private backyard. 4 Bedrooms up with custom paneling & crown mouldings throughout. Newer exterior wood siding & shingles, furnace and hot-water tank. Easy to show this comfortable family home. Open House Sunday June 23rd, 2-4pm. The perfect affordable home in South Main! This top floor south facing spacious 1 bedroom is situated across from Tea Swamp Park just a block to endless cafes and shops. A delightful space that has room for your own personal touch and decorating ideas! An open airy balcony, walk through kitchen, separate dining area, freshly painted, new carpet and gas fireplace with cedar surround beams. A very roomy bedroom with tons of light and large closet. Insuite storage could be converted to an office or laundry. Popular, reputable building with new plumbing, new roof, resurfaced balconies and a long range maintenance plan in place. There's a storage locker, secure parking, designated bike storage area and a car wash bay! Pets are declined. Rentals at the max. You can laze on your deck overlooking the quiet tree-lined street. Floor plan and additional photos available on the realtor's website. I have sold a property at 211 221 UNION ST in Vancouver. V6A - Large loft with lots of space and high ceilings plus a massive patio outdoor space. Full size Kitchenaid stainless steel appliances, designer cabinetry and quartz countertops. Polished concrete floors and spa bathroomgive this the look and feel for your urban lifestyle. A well equipped fitness centre and the confidence of a newer building with warranty. Downtown, Chinatown, Gastown and Strathcona all at your doorstep. YOU'LL LOVE IT! Please visit our Open House at 708 2228 BROADWAY W in Vancouver. "THE VINE" This is one of the best one bed + dens in the building. 7th floor overlooking the courtyard. Away from Broadway with views of the water, freighters, mountains and over top of Kits. Super convenient to shopping, transportation,the restaurants and recreation for your Westside lifestyle. Big open plan rooms, south west facing balcony, walnut engineered floors, Granite countertops, stainless steel appliances, kitchen island, insuite laundry and a large usable den space. Bright, Fun and in the heart of it all. YOU'LL LOVE IT! Please visit our Open House at 303 2825 SPRUCE ST in Vancouver. This a character, three bedroom, two bathroom, two level completely renovated, penthouse apartment with a large roof top deck. Lots of mid century era features including railings, refinished hardwood floors, massive rooms, a curved featurewall, jewel box corner display and a long wall of windows overlooking a tree lined street. New kitchen with granite counters, Bosch Dishwasher, GE Profile appliances and Venmar range hood. New bathrooms with soaker tub, designer tile, pedestal sink and oversized shower ensuite. Upper bedroom makes a great office with a library wall and direct access to the deck. Super location convenient to shop, transportation, the hospital downtown and all that the city has to offer, YOU'LL LOVE IT! VANCOUVER, B.C. – July 3, 2013 – The Greater Vancouver housing market continues to maintain a relative balance between the number of homes for sale and the number of people looking to purchase a home in the region today. The Real Estate Board of Greater Vancouver (REBGV) reports that residential property sales in Greater Vancouver reached 2,642 on the Multiple Listing Service® (MLS®) in June 2013. This represents an 11.9 percent increase compared to the 2,362 sales recorded in June 2012, and an 8.3 percent decline compared to the 2,882 sales in May 2013. Last month’s sales were 22.2 percent below the 10-year sales average for the month, while new listings for the month were 11.5 percent below the 10-year average. New listings for detached, attached and apartment properties in Greater Vancouver totalled 4,874 in June. This represents a 13.2 percent decline compared to the 5,617 new listings reported in June 2012 and a 13.8 percent decline from the 5,656 new listings in May of this year. The total number of properties currently listed for sale on the MLS® in Greater Vancouver is 17,289, a 6 percent decrease compared to June 2012 and a 0.4 percent increase compared to May 2013. The sales-to-active-listings ratio currently sits at 15 percent in Greater Vancouver. This is the fourth straight month that this ratio has been at or above 15 percent. The MLS® Home Price Index composite benchmark price for all residential properties in Greater Vancouver is currently $601,900. This represents a decline of three percent compared to this time last year and an increase of 2.3 percent compared to January 2013. Sales of detached properties reached 1,102 in June 2013, an increase of 19.7 percent from the 921 detached sales recorded in June 2012, and a 25.1 percent decrease from the 1,471 units sold in June 2011. The benchmark price for detached properties decreased 4.3 percent from June 2012 to $919,900. Sales of apartment properties reached 1,068 in June 2013, an increase of 4.1 percent compared to the 1,026 sales in June 2012, and a decrease of 15.6 percent compared to the 1,266 sales in June 2011. The benchmark price of an apartment property decreased 1.9 percent from June 2012 to $369,100. Attached property sales in June 2013 totalled 472, an increase of 13.7 percent compared to the 415 sales in June 2012, and a 10.1 percent decrease from the 525 attached properties sold in June 2011. 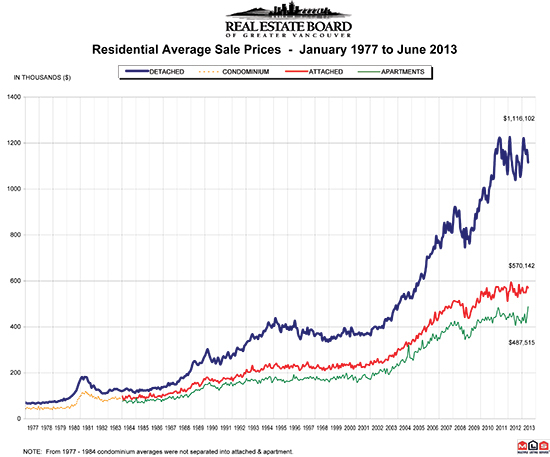 The benchmark price of an attached unit decreased 2.4 percent between June 2012 and 2013 to $457,000.